notes on computing: Does the Internet need another browser? Does the Internet need another browser? Do we need another browser? Yes; the Internet needs a well defined standard and reference implementation adopted and contributed by all. The browser, possibly the most used software of all times, needs a standard to address the several and varied functions it evolved to from the early html-rendering days. 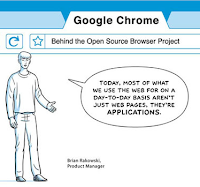 Google is introducing today more than a software product; it is a proposed common platform, reference design and implementation to collectively work and evolve a modern browser. WebKit. It uses a well known and well tested web rendering engine, WebKit, used by Safari, Nokia, Google's Android and several others. Task isolation. Tabs and Plug-ins run on assigned processes. One tends to have tens of tabs open; if one crashes it generally crashes the entire application. Security and process isolation are also welcome byproducts of this design. Offline mode built-in. Gears is built-in resulting in offline operation for applications that use this capability; Gmail, Docs, etc, are likely to be the first applications to use it. Open sourced. Means that FireFox, Safari, Opera, and yes, IE, can incorporate some or all the technology proposed by Google; everyone wins; a standard is needed and one is available for test and development. Whether Chrome's technology is used by other browsers or not, Google has the cloud and now the cloud's client resulting in a formidable software combination through which to deliver services independent of platform and form factors as Chrome shows up on MS Windows, Macs, Linux, Android, and other wired and increasingly wireless units. One can easily conceive an upcoming Chrome net-book, named cbook, gbook, Android-book or any other name likely starting with g, running, you guessed it, Chrome, as the graphical user interface and Android as the OS. Google's blog entry re subject is found here. Nicholas Carr has written a blog-entry defining it as the Cloud's Chrome lining.